There are hundreds of dog breeds, all of various shapes and sizes with varying requirements and personalities. Finding the right puppy from all the breeds of dog available can be a tricky business but there's help at hand! Our easy guide will set you off in the right direction. Don't forget our choosing a dog page tells you the secret to picking the perfect puppy or dog for you. Every time! Simply read about the general characteristics of the 6 main types of dog. You can find out more about each of the dog breeds by clicking on their link.. In general, hunting dog breeds are of small to medium size and are considered to possess a happy and intelligent temperament. However, most of these dogs are happiest when 'working' and they can be prone to hyperactivity and over dependency problems at home. This can be especially true of puppies bred from working stock or on farms. These dog breeds generally to make good pets, especially Labradors and Retrievers, which are renowned for their gentle and obliging nature. 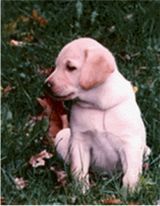 Setters, Golden Retrievers, Labradors, Labrador Retrievers, Pointers, Cocker Spaniels and Springer Spaniels. With the exception of the Corgi, the dogs in this group are medium to large in size and require a lot of exercise and close handling. The larger dog breeds are usually bred for guarding or livestock control. They are extremely strong, and as such can be very difficult to control on walks or at home if they are not fully trained in obedience skills. Working dog breeds are generally known to bond with individuals and are considered to be affectionate and protective towards family members. Because of these attributes it is important to get your puppy from a responsible breeder, to ensure that it is good natured towards people and other animals. Boxers, Rough, Shetland and Border Collies, Welsh Corgi, Dobermann Pinscher, German Shepherds, Old English Sheepdog, Briard, Bouvier, Mastiff, Rottweiller, Newfoundland, Great Dane and St Bernard. All know how to follow a scent until it goes cold – this may mean up hill and down dale and miles away from your control! Dogs from this group can form very close bonds with individual owners and this can lead to over dependency. When they are challenging their energies to 'hunting and foraging', these dogs are in heaven. If you have plenty of time for walking, then a hound can be the perfect companion. However, long periods spent away from its owner can lead dog breeds of this type to it becoming withdrawn and unhappy. Basset Hounds, Beagles, Deerhounds, Irish Wolfhounds, Daschunds, Whippets and Greyhounds. The range of sizes varies dramatically, especially amongst Poodles. Opinion is split on their nature, some such as smaller Poodles and Dalmatians can make good family pets, where as others, such as Bulldogs, can be difficult for children to handle. Dalmations, English Bulldogs, American Bulldogs, French Bulldogs, Shih Tzus and Poodles. Terriers are generally small, tenacious dogs, considered happy and energetic by nature. These dog breeds feature dogs which are endearing, extremely alert and make excellent watch dogs. Terriers require daily exercise (but not as much as larger breeds). With firm handling they can make great family pets. Airedale, Boston, Welsh, Border, Wire Fox, Cairn, Jack Russell, Staffordshire, Scottish, Lakeland and West Highland White, Miniature Schnauzer. As the name suggests, these dogs are small! They are generally lively and intelligent and do not require a huge amount of exercise – but they do demand a great deal of attention from their owners! Papillion, Cavalier King Charles Spaniels, Lhasa Apsos, Chihuahuas, Poodles, Pekingeses, Pugs and Yorkshire Terriers. Choosing a name for your puppy? We have put together 26,649 dog names in one place for just $5. Plus Free a bonus report. Dog crates and carriers represent an essential ingredient for successful house training and safe travel. All dogs love their bed! We show you how to choose the ideal beds for your puppy or dog then tell you the best places to buy them from. how to care for and enjoy them to the maximum?